We found fantastically beautiful wall plates that’ll brighten up any dull corner in seconds. And we thought you should get one. Cyahi – an online platform that sells quirky home decor and essentials has us talking for the right reasons. They have colourful wall plates that’ll bring out the potential of that neglected wall in your living room. Hanging wall plates is the easiest way to transform a room’s look. Their wall plates are priced at INR 699. Besides wall plates, their dining plates also have our heart. 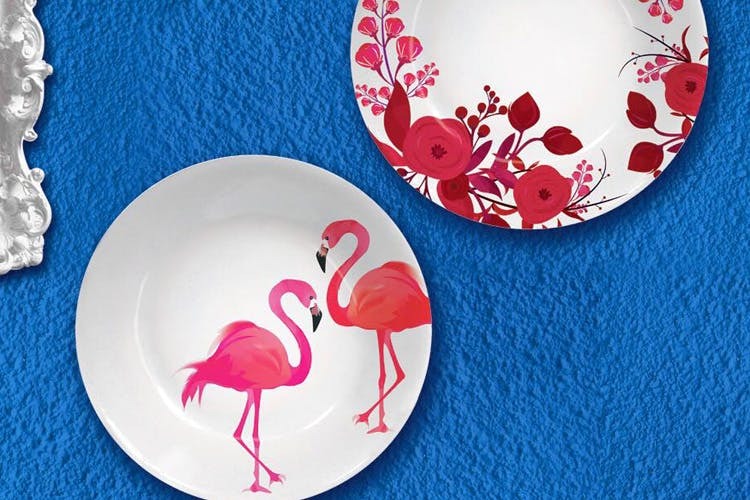 Boasting of pretty floral prints, their dining plates will increase the joy of eating, we think. They start at INR 999. Also, check out their art prints starting INR 1,749. Cyahi has kind of nailed the art of covering white or bare walls with awesome. We’re fans already. Floral Tableware, Phone Cases and Art Prints at Cyahi Design Co.